Gite Tamsoulte is decorated in a traditional Moroccan way. The guest house has a Moroccan living room and a terrace with panoramic view, on the mountains and Mizik Village. Guests can enjoy local cuisine prepared by guests on request. Free Wi-Fi access is available. Gite Tamsoulte is ideally located for those who want to discover the richness of the area and are looking for trekking holidays. 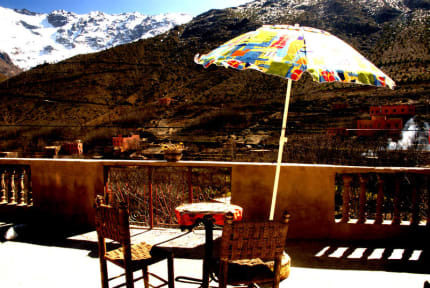 Gite Tamsoulte is located between the center of Imlil and the Toubkal Mountain starting point. Gite Tamsoulte offers well-decorated and comfortable private rooms. The property has double rooms (with double bed or 2 twin beds) and private bathroom, large rooms for 3 and 4 people. Perfect for small groups of families. Taxes NOT included - Local occupancy tax 2.50 euros. I had a really wonderful stay at this guest house! Abdoul was really helpful with everything I needed. He booked a donkey for my hike to toubkal and was able to help me rent the equipment I needed. The food his wife made was delicious and the accomodation was nice and cozy. 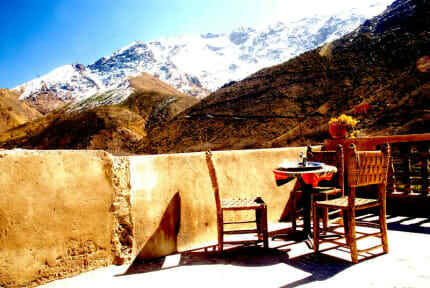 Very friend and comfortable place for your journeys into the Atlas mountains! I am so happy I found this wonderful guest house. Thanks for everything!